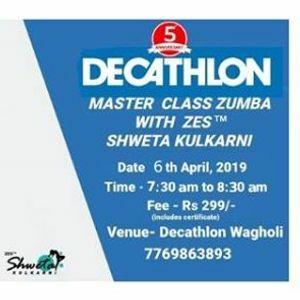 On the occasion of Decathlon Wagholi's 5th Anniversary, we invite you all to join us for Masterclass Zumba by the known Zes Shweta Kulkarni. 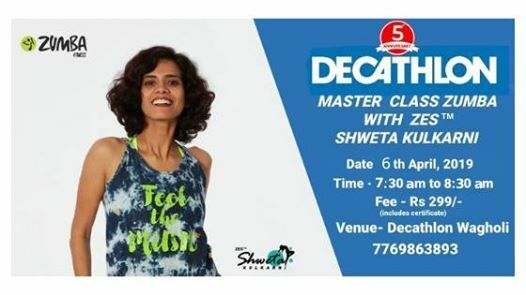 Shweta Kulkarni lives in Pune, Maharashtra. Have been a ZIN™ Member since Jun 2011 and absolutely love teaching Zumba classes. The reason is simple: Every class feels like a party! She currently licensed to teach Zumba, Zumba® Toning, Aqua Zumba®, Zumba Gold®, Zumba® Kids & Kids Jr., Zumba® Step. Come join her, and guarantee you will have a blast! 1. On spot, registrations will be accepted. Note - Certificates will not be given for on spot registrations. 3. 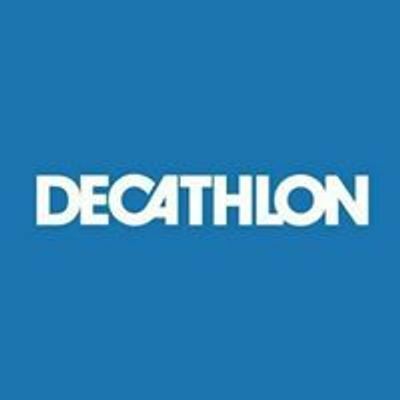 Registrations will close 4 days prior to the event.